When you watch Doctor Who Season 10 Episode 2 online, the Doctor invites Bill to take a trip in the TARDIS -- despite Nardole reminding him of an oath he took to not leave Earth except in cases of emergency. He offers to take her to the past or the future, and she chooses the future. So they land at a human colony in the distant future. There's just one slight problem: there are no colonists to be found. The grounds are empty, and the only things there are robots that communicate through emoji symbols. It soon becomes obvious that there is something sinister at play, and that something dreadful has happened to the inhabitants of the colony. The Doctor realizes the situation is even more dire than it first appeared when he puts together that original inhabitants of the colony were just a skeleton crew, preparing the way for a whole huge batch of colonists, who are unwittingly going to walk right into the same trap that their predecessors did and meet the same horrific fate they did. 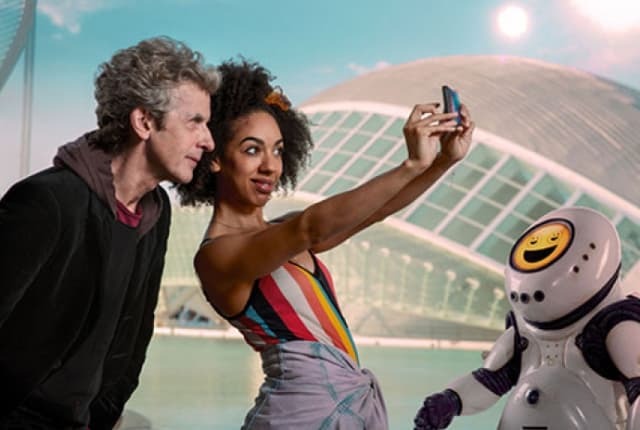 Will the Doctor and Bill discover how to end the threat of the emojibots? Find out what happens when you watch Doctor Who Season 10 Episode 2 online. Once, long ago, a fisherman caught a magic haddock. The haddock offered him three wishes in return for its life. The fisherman said, “I’d like for my son to come home from the war. And a hundred pieces of gold.” The problem is, the magic haddock, like robots, don’t think like people. The fisherman’s son came home from the war, in a coffin. And the king sent a hundred gold pieces in recognition of his heroic death. The fisherman had one wish left. What do you think he wished for? Some people say he should have wished for an infinite series of wishes, but if your city proves anything, it is that granting all your wishes is not a good idea. [...] In fact, the fisherman wished he hadn’t wished the first two wishes. Nardole: Excuse me? What *is* the TARDIS doing down here? The Doctor: I’m over two thousand years old. I don’t always want to take the stairs. Permalink: I’m over two thousand years old. I don’t always want to take the stairs.